디자인에는 경계가 없다. 각각의 디자인 분야에서 경계가 희미해지고 있기 때문에, 각 분야를 이름 지어 구분하는 것은 무의미해졌다. 레일이 있는 풀장에서는 가야만하는 길이 정해져있었다면, 레일이 없는 물속에서 우리는 구획의 제약을 받지 않고 각자가 원하는 방향을 설정하여 스스로 갈 길을 개척해나가야 한다. 2016년도 건국대학교 커뮤니케이션 디자인학과 졸업전시는 본인이 스스로 목표를 설정하고, 그 목표를 향하여 끊임없이 노력하여 일궈낸 과정이자 결과물이다. 이 전시를 통해 관객들은 학생들이 다양한 방법으로 물 속을 유영한 결과물들을 볼 수 있다. 누군가는 넓게 헤엄치고, 누군가는 깊게 탐험하는 작업을 했을 것이다. 시시각각 변위하는 물 속에서 그 어떤 방식이 더 낫다고 할수는 없다. 우리는 물속에서 정답을 향해 나아가기보다 각자의 목표지점에 도달하기 위해 다양한 매체를 활용하여 관객들과 커뮤니케이션하고자한다. 이번 커뮤니케이션 디자인학과 졸업전시는 4년의 배움을 마무리 지으며 42명의 학생들이 자유로이 유영하는 장으로써 부족함이 없다. resulted from different methods chosen by each student. Some students have chosen to swim broadly, on the other hand, some have chosen to explore deep into water. It is not necessary to judge whether one method is better than the other, as every method has its own uniqueness. We intended to communicate with audiences by achieving our own goals using different media rather than trying to find the answer. 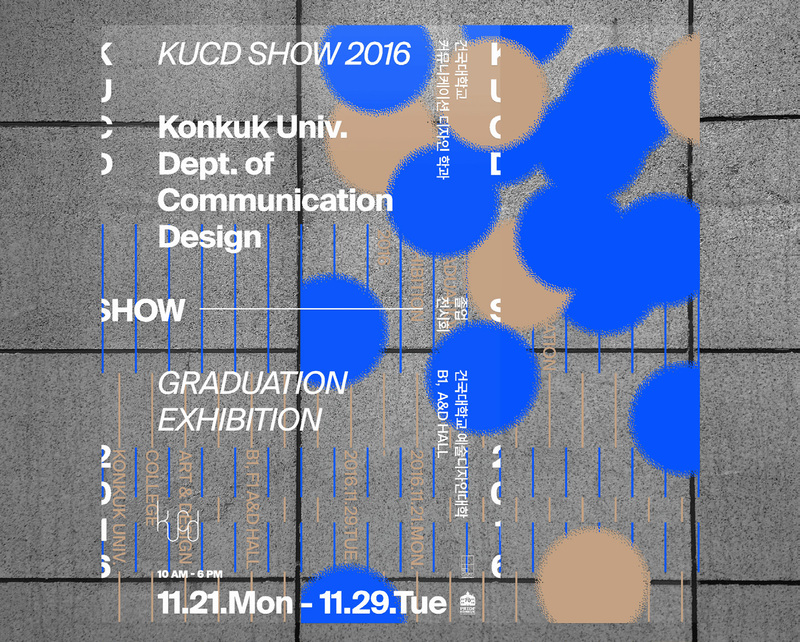 This graduate exhibition is the perfect place for our 44 communication design students to swim freely, as a ground for our final project of undergraduate.